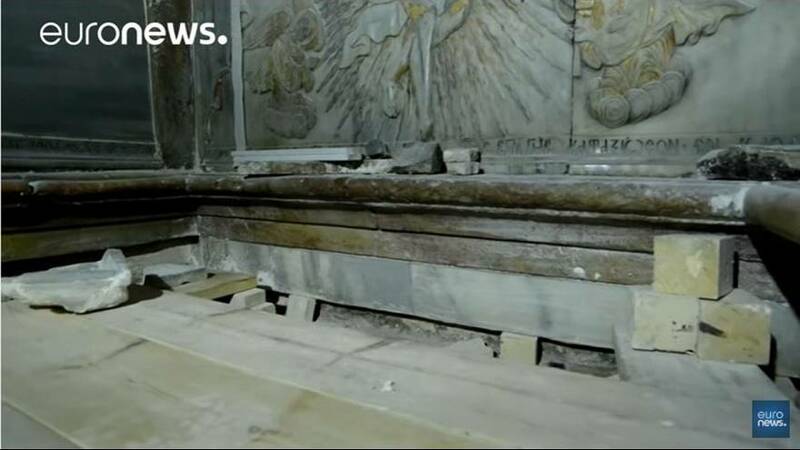 In the innermost chamber of the site said to be the tomb of Jesus, a restoration team has peeled away a marble layer for the first time in centuries in an effort to reach what it believes is the original rock surface where Jesus’ body was laid. The chamber lies at the center of Jerusalem’s Church of the Holy Sepulchre, one of Christianity’s holiest sites. The work forms part of a project to reinforce and preserve the Edicule, which is built around the cave where Jesus is said to have resurrected following his execution and burial. Six Christian denominations practice their faith at the 12th century Church of the Holy Sepulchre and getting agreement from all of them can be a challenge. British authorities built a metal support structure after taking possession of the church after the Second World War but the site has degraded since. However, under threats of closure from the Israeli authorities who deemed the site was becoming a safety risk, the work was permitted. However only 60 hours were granted to the renovation teams led by the University of Athens. The last time the tomb was opened was in 1810 following a fire. However, the marble slab believed to cover the rock where Jesus lay has not been removed since 1550. A pulley was used to slide open the marble slab revealing a layer of debris and below that another marble slab marked by a cross. The have also cut a window into the wall of the Edicule to allow pilgrims to see into the tomb itself.